It feels weird heading into London at the end of the day, destined for a walking trip. The usual stressed and miserable faces passing me are replaced by somewhat more relaxed, and somewhat less sober ones. I arrive at Paddington and settle down for a beer to wait for Rich (@FlintyRich) to turn up. I follow his progress into and across London by a stream of social media check-ins. He joins me with a beer and we sit out the remaining wait time before the train catching up on things since we last met up. Unable to book proper sleeping berths, we’re in seats and find ourselves masters of a whole carriage-width block of six. The train pulls out past the statue of the eponymous bear and my first experience of the Night Riviera Sleeper begins. Gradually the carriage settles down, screens dim, voices hush and are replaced by snores and the sounds of people wriggling to get comfortable in their seats. Rich lies slumped over the table, head cradled on arms, while I contort myself trying to find a sleep position that won’t leave me aching all over in the morning. The train comes to a halt and sits still for an hour. The lack of motion brings me to my senses and I look out of the window to see we’re in Exeter. A wave of nostalgia for the time I lived here sweeps over me, and prevents the return to sleep. 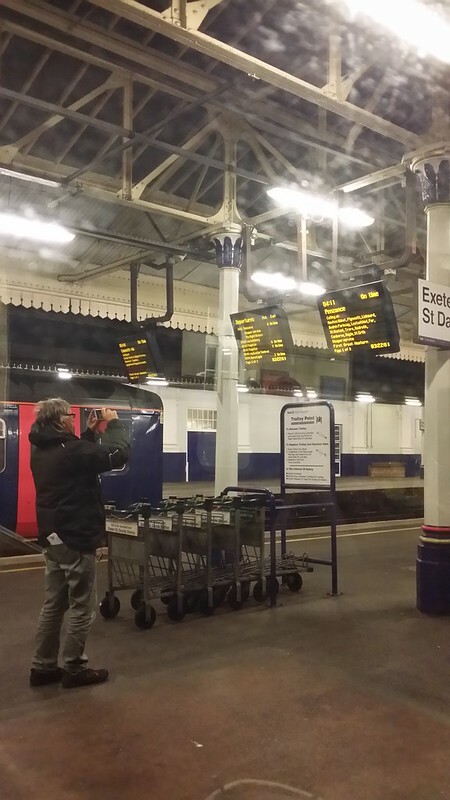 Outside a man stands in front of the platform information board taking a photo of it. Presumably it’s his first time on the sleeper too – either that or he’s one of the trainspotters that always seemed to be at the station at all hours when I was a student here. Sleep is fitful for the remaining distance to Plymouth. Some Noisy Young Things embark and talk loudly between the carriages, preventing anyone getting back to sleep. Luckily they leave at Newton Abbot, thereby saving us the trouble of beating them to death, and the carriage returns to quiet. We pull into Plymouth and the zombies alight. Over half an hour until the bus, and then we find ourselves waiting in the rain until it arrives a further 35 minutes late, just as we’re about to give up on it having researched alternative options on our phones. Meanwhile, the black sky has lightened to dark grey, dumped some rain on us and brightened up. 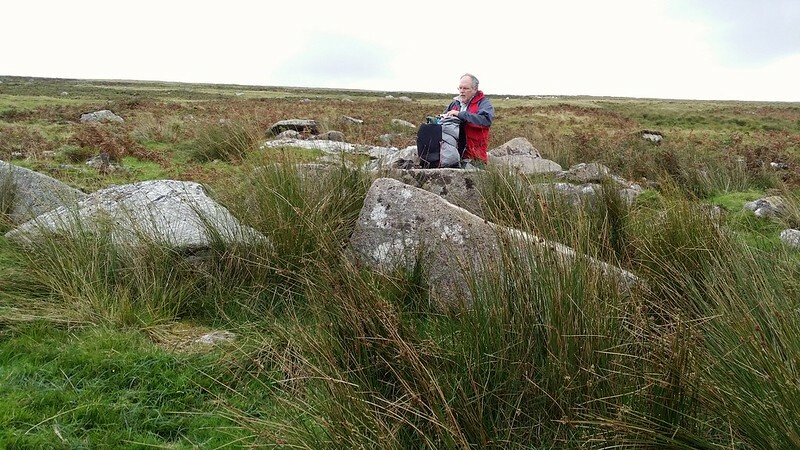 A call with Paul (@paulgbuck) and he picks us up in Yelverton. 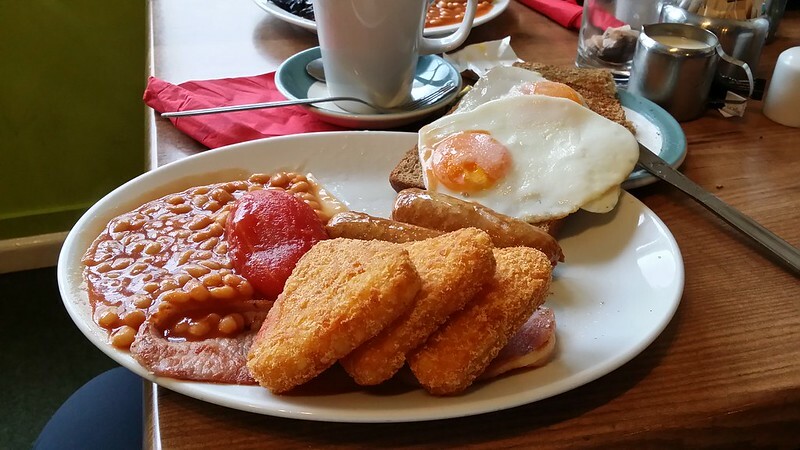 First stop is, of course, the Fox Tor Café for breakfast – a key ritual in our Dartmoor jaunts. 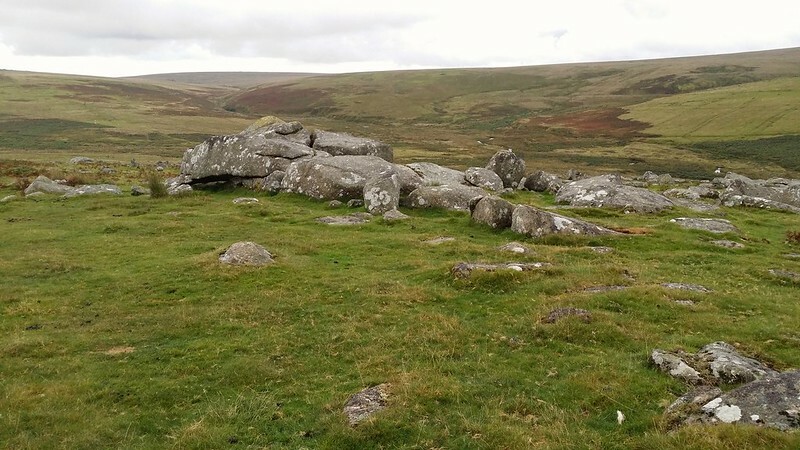 We drive up onto the moor and park below Gutter Tor. After all of the rain, the first steps on grass are tentative but we find the ground not too bad, very little waterlogging. 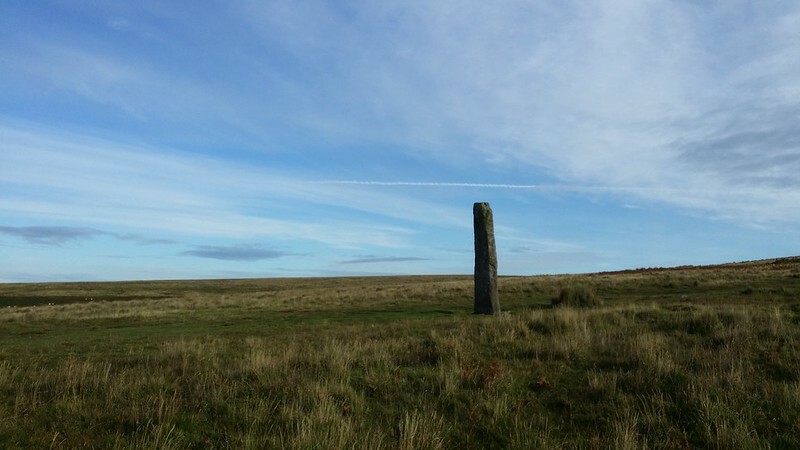 The tor top is gained, the standard ritual of pausing on the top long enough for phones to ping with Twitter notifications that we’ve bagged the tor. 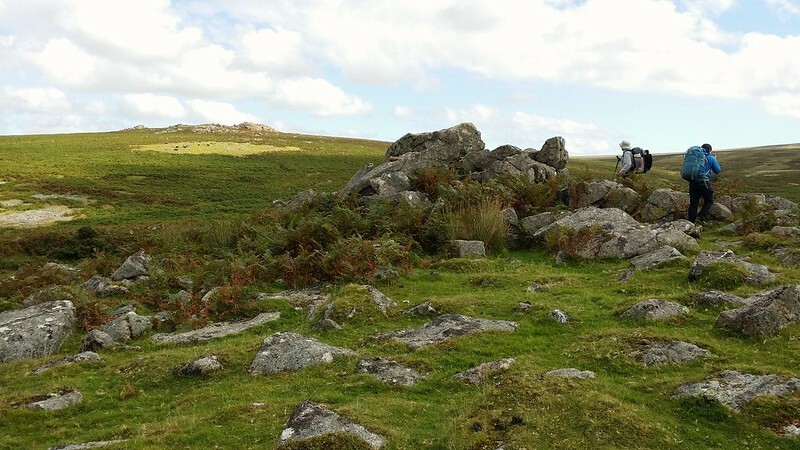 Then it’s via Legis Tor down towards the Plym, a wide fast-flowing and rock-strewn torrent of water. Paul heads downstream looking for a suitable crossing. So far ahead does he get that he guides us from the opposite bank, the rocks of Shadyback Tor rising behind him. Rich and then I step gingerly through the shallow(ish) water, our walking poles deployed for safety. 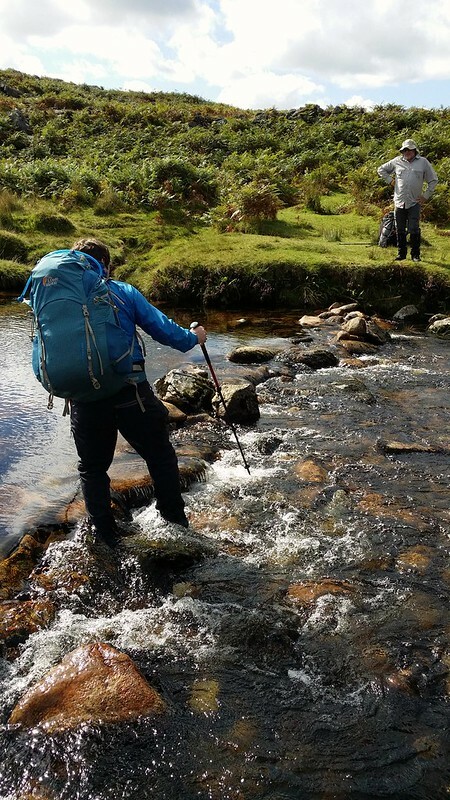 The crossing is only achieved at the expense of soaked feet and lower legs. But they will dry out. 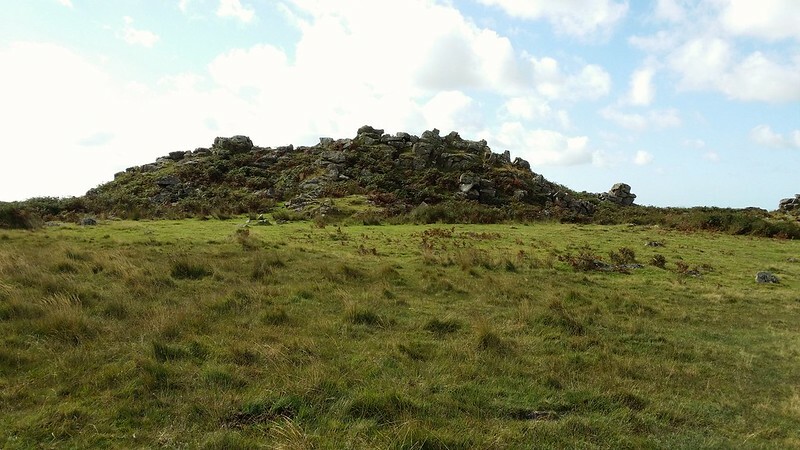 We climb up to the tor, wait for the Twitter ping and not getting one, head further up the hill – this tor’s not on the summit. There among old ruins the ping is achieved. 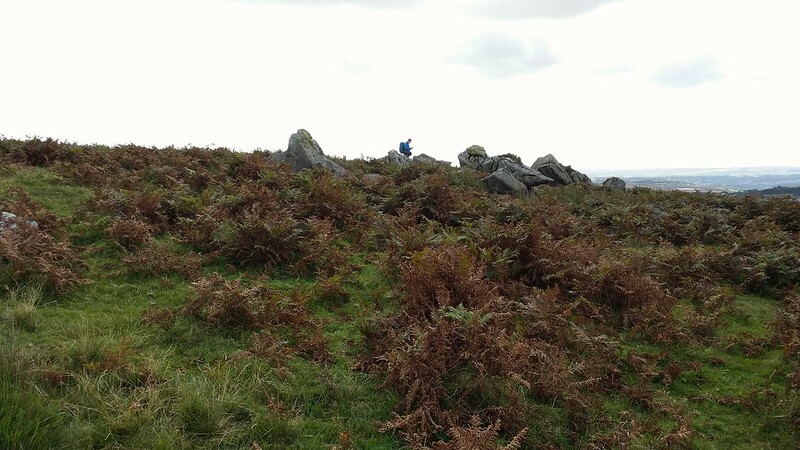 A mental note is made to tell Phil (@DaylightGambler) that the tor is not where @SocialHiking says it is. 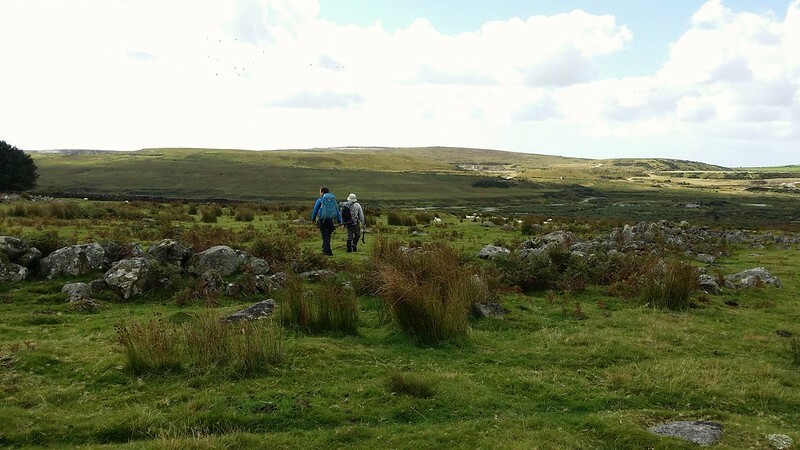 A trudge across rough grass, some ditches to cross and then we’re climbing up to Little Trowlesworthy Tor and shortly after Great Trowlesworthy Tor. 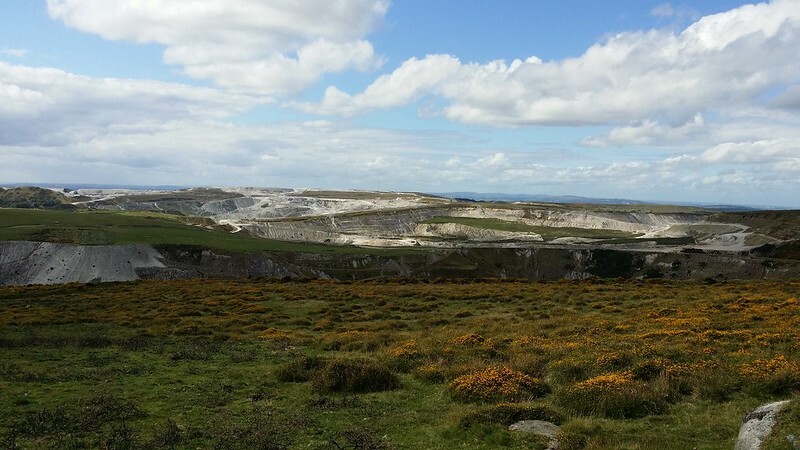 A longer break is taken on Hexton Tor, overlooking the China Clay works before we’re following the track that contours around the moor, our mission to find the not very prominent Rook Tor. Ironically, it’s right where it should be, a look at the laminated card made from Ken Ringwood’s book (back in print soon) confirming the location. We pause further before the big climb up onto Penn Beacon and Shell Top. This morning’s Plymouth rain is a distant memory as small patches of blue appear in the sky above us. 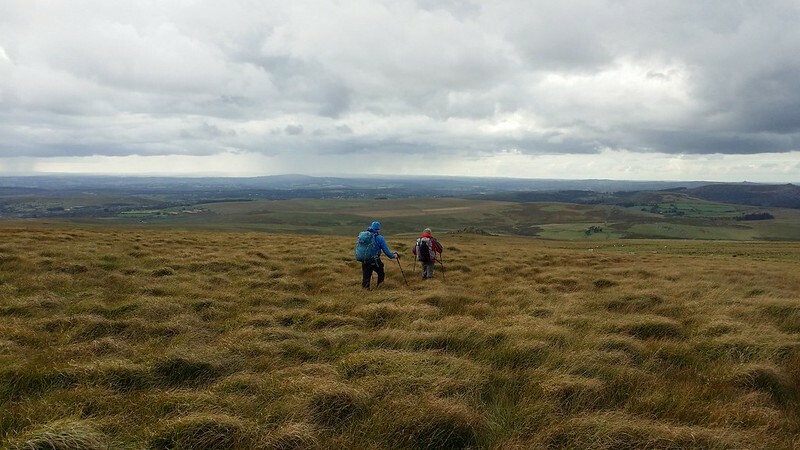 We slog up onto Penn Beacon, each tor now the subject of a longer rest pause. Despite this I’m surprised how non-tired I’m feeling considering I’ve had about 2 hours sleep. What I am starting to tire of is Rich’s new catchphrase, ending every snippet of conversation with “other ….. are available” like a Blue Peter presenter trying not to favour a particular brand when making something out of junk. mind you Paul and I are as bad, the standard jokes and ritual innuendos the soundtrack to a group of mates out for a walking adventure. 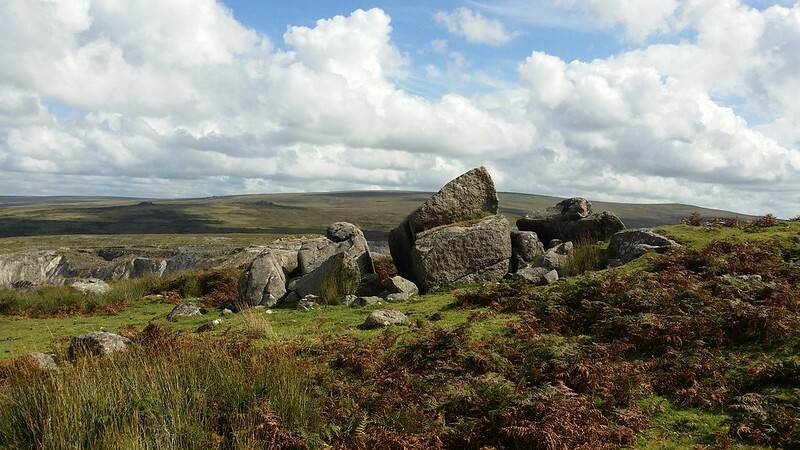 We head north across the moor from Shell Top to find Hen Tor through the long tufty grass. 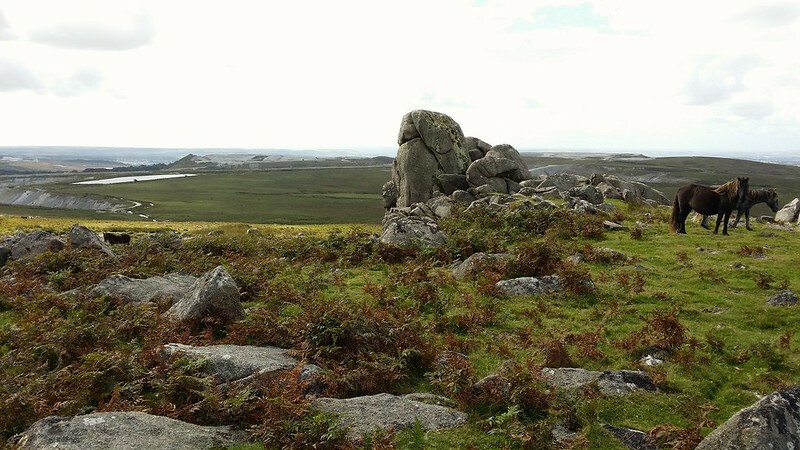 Down below us we can see the rocks that are Little Hen Tor and head off past some wild ponies to bag them. Only to find afterwards that they weren’t the tor, so another visit will be required. We do, however, find Shavercombe Tor, before we head down for another crossing of the Plym. Another long walk downstream is needed before we find a safe place to cross, my now-dried feet receiving a late-in-the-day re-soaking from which they won’t recover. 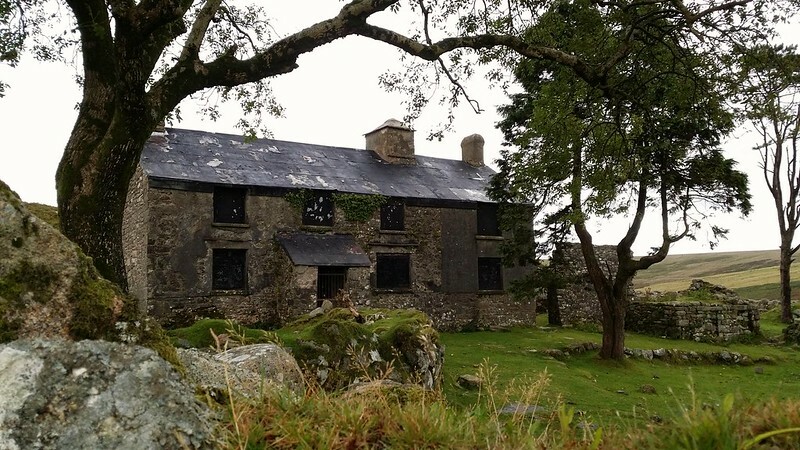 We stagger out of the river and take a look at Ditsworthy Warren House. 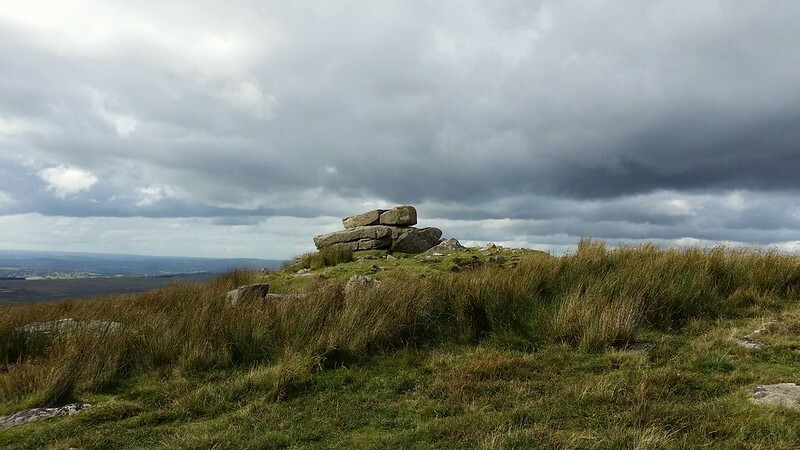 Up over Eastern Tor, a bit of to-ing and fro-ing to find the right pile of rocks marking the baggable point and then we’re heading down towards Drizzle Combe and the Giant’s Basin. 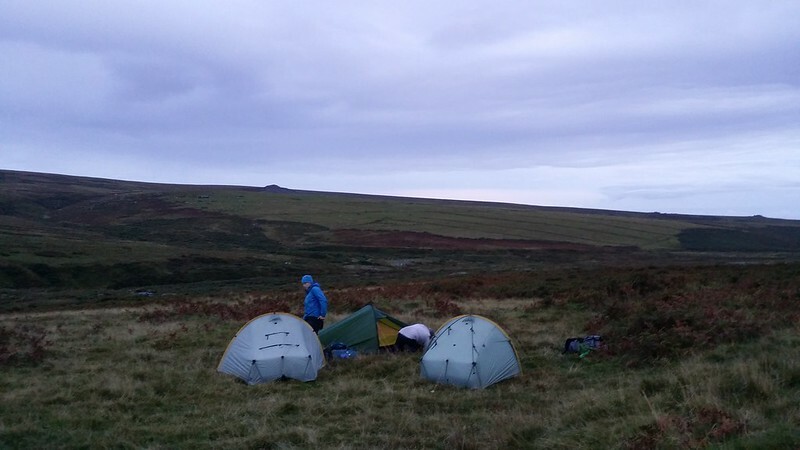 Paul tries to recall a former camp spot which easily held 3 tents, but which now is clearly buried beneath bracken. We find ourselves back alongside the Plym and take advantage of this to fill up with water for camp. 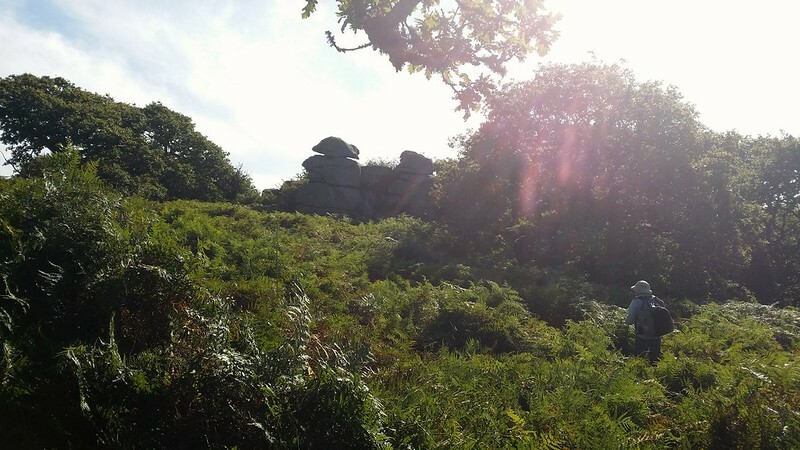 We find a camp spot further uphill in a hollow near a standing stone. Tents are put up, the usual jokes about big erections being trotted out formulaically. Rich’s is looking decidely flaccid. 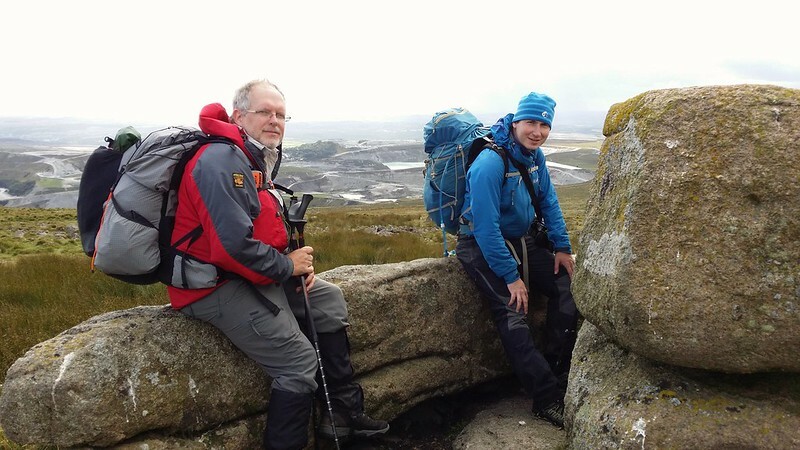 The usual comparing of gear takes place – today it’s mats and the inside space of tents. Rich reveals a litany of mat-related strife involving popped baffles and multiple replacements, and clearly the mat heard him as more baffles go a short while later. Rich reveals that he’s turning into a girl as he breaks out the fruit teas, but settles for the euphemistic “Less Than Manly”. The evening continues with companionable chat about gear and past walks, but it’s clear we’re all feeling a bit tired. It’s not a late night. 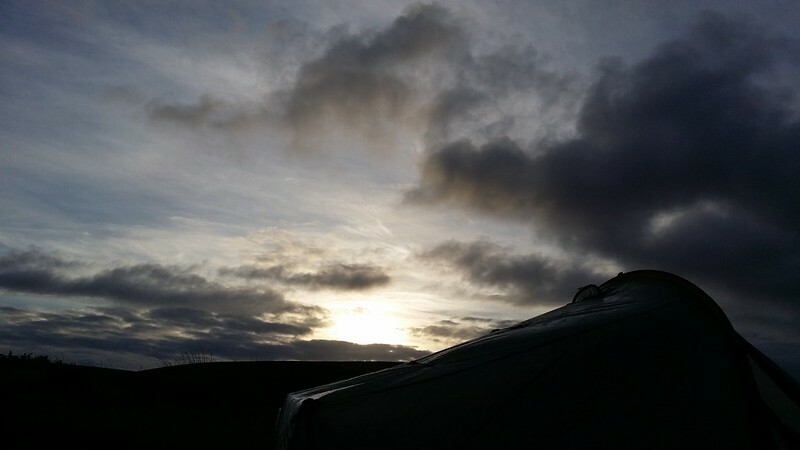 I never sleep particularly well the first night in a tent, but it seems last night was an exception. I slept like a log, most likely because of the lack of sleep on the train. 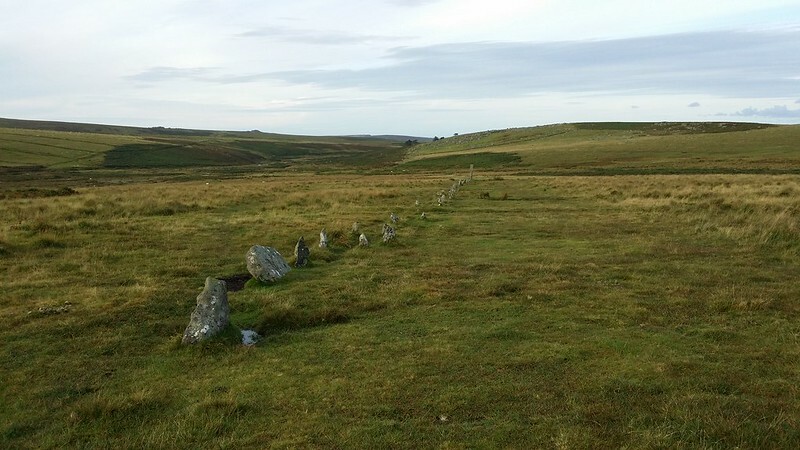 We pack up and climb over the ridge to look at the standing stones and stone row. We find a discarded riding crop and more ribald jokes occur. 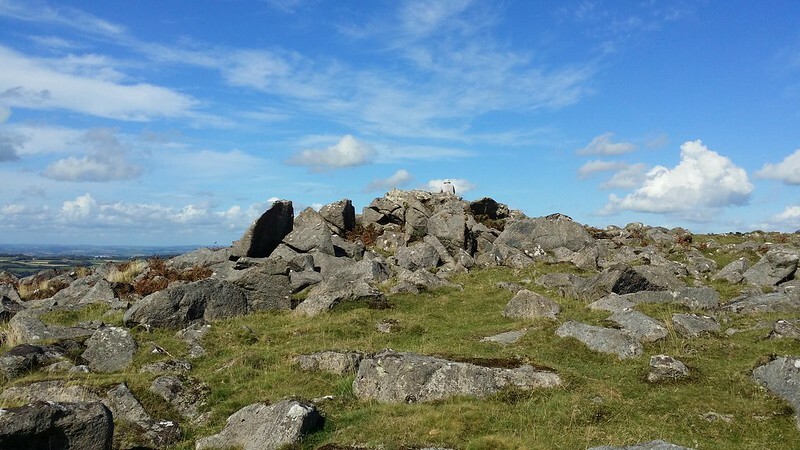 An extensive field of rock from ruined settlements lies before us and we take it in as we head for the last bag of the walk – Whittenknowles Rocks. We skirt the scout hut (try saying that after a couple of drinks) and find the car safe and unharmed after it’s vigil. 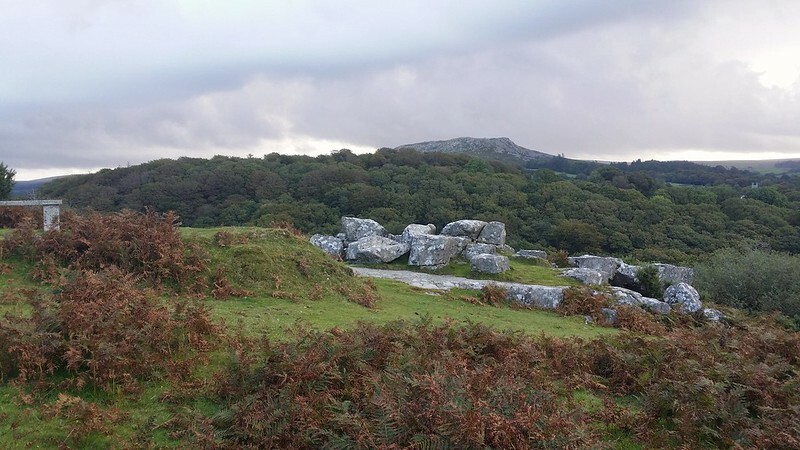 In view of the improving weather, a plan is made to bag some more tors the other side of the China Clay works, but first we decide to stop off at Claig Tor to pick off this one that I missed from the Burrator Round earlier this year. It’s a ten minute excursion as the tor lies just a couple of dozen metres above the car. 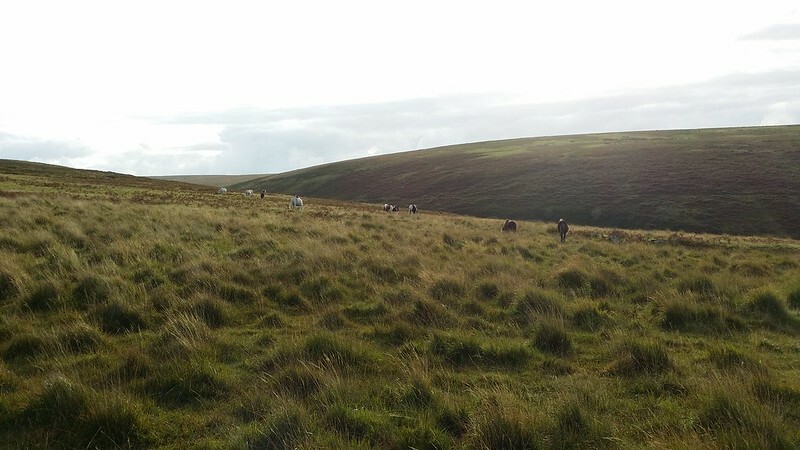 Next we park up at Lee Moor and set off for a longer walk. 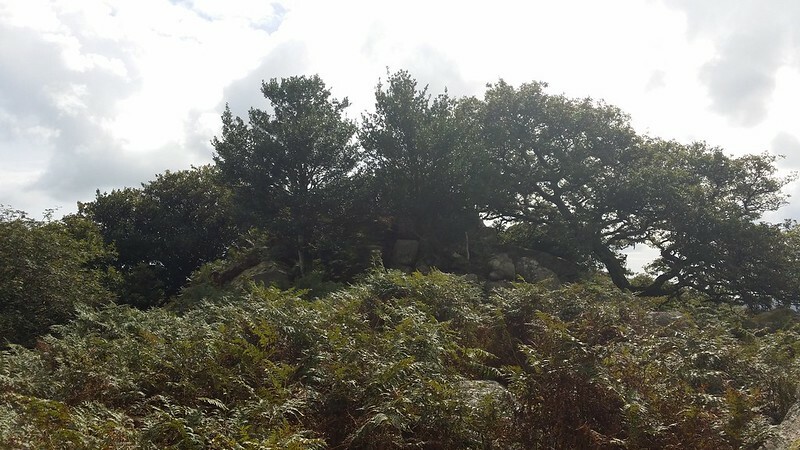 First up is Blackalder tor, which we find as a tumble of moss-covered rocks in a wood. It looks nothing like its picture in the Book. We surmise that the tor proper is above and behind the trees. 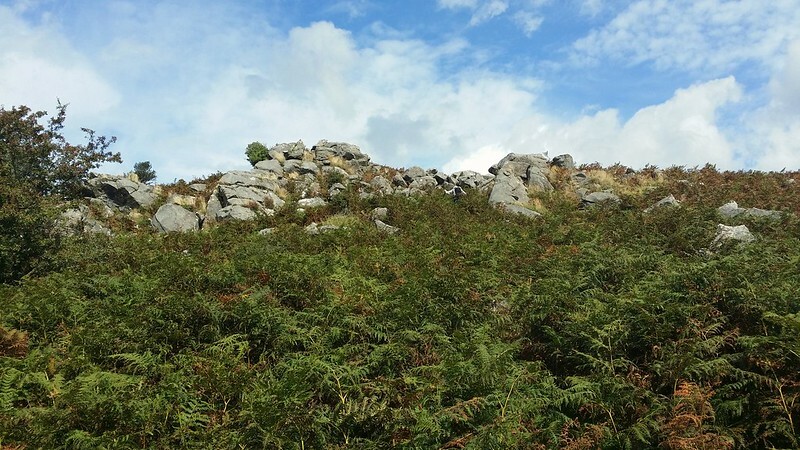 Indeed it is, but there’s a lot of chest-high bracken between us and it. A variety of paths are taken, none of which feel very secure underfoot. 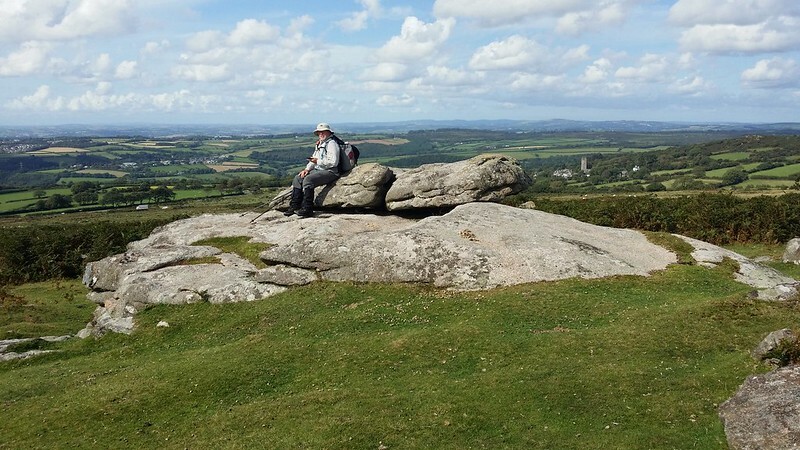 The sense of relief at sitting on the tor is palpable. The effort to reward ratio for this one is not favourable. We struggle back down off the rocks and through the bracken to the path. 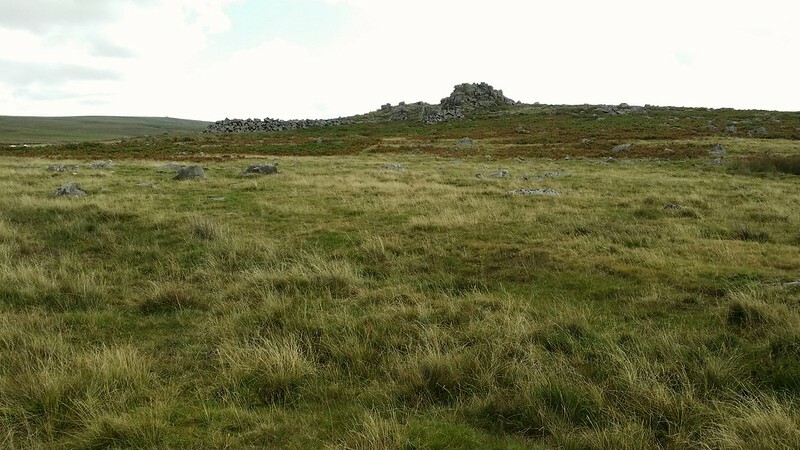 Collard Tor is found relatively easily on the open hillside. Or so we thought. No ping, but obviously the real tor from our vantage point, we note this one down as another inaccuracy and head onto Hawks Tor. Again the main outcrop doesn’t yield a ping, but halfway to the lower outcrop it does. 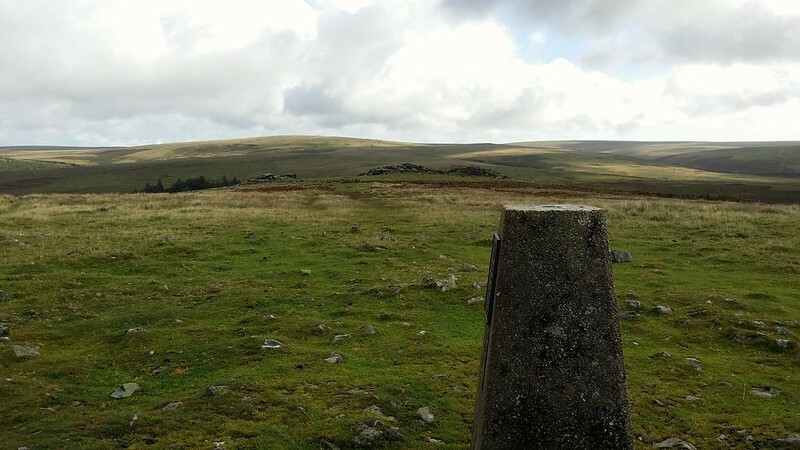 It’s a fine day now and despite the irritation at tors not being where they should be, we’re happy to continue and make the most of the walk. 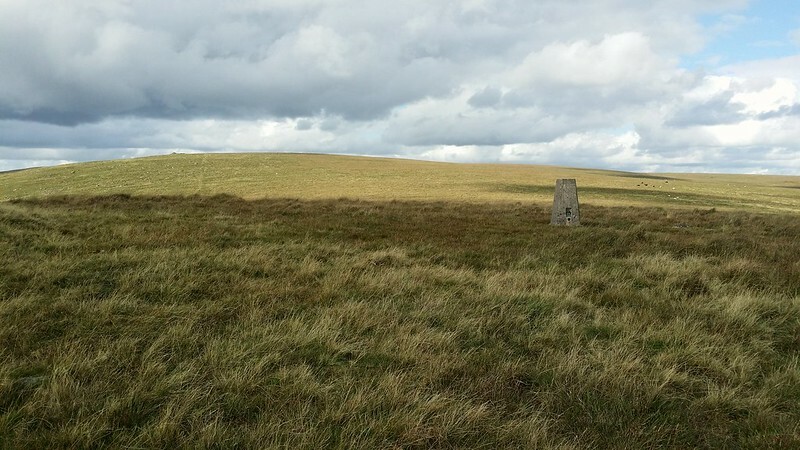 On to Saddlesborough, we find the trig easily. A debate ensues as to where the tor itself is, Paul favouring a spot to the west, me the obvious rocks more to the north. We separate to investigate. Happy I’ve found Lupton Tor by virtue of the picture cards I’ve got, Rich and I sit and wait for Paul. He bounds up and says there’s nothing at the point the tor’s supposed to be. This is clearly the tor. Another one for Phil to move. 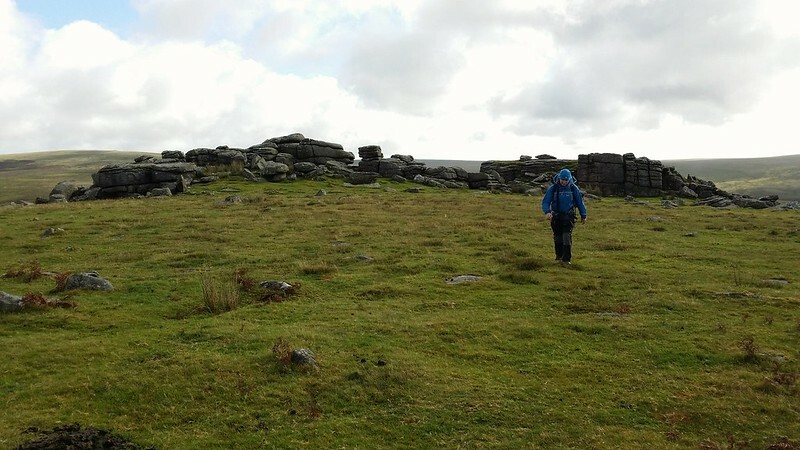 We head back along the ridge and divert downhill to see if we can see what the issue with Collard tor is. It’s blindingly obvious as we reach the road and look up. A quite noticeable tor rises up from the steep bracken hillside. With a sigh, we set off to regain the hill and are rewarded with the prized ping. Up and over the top we rock-hop to the point we’d been earlier and spend a few minutes chatting with locals. Then it’s down and back to the car. 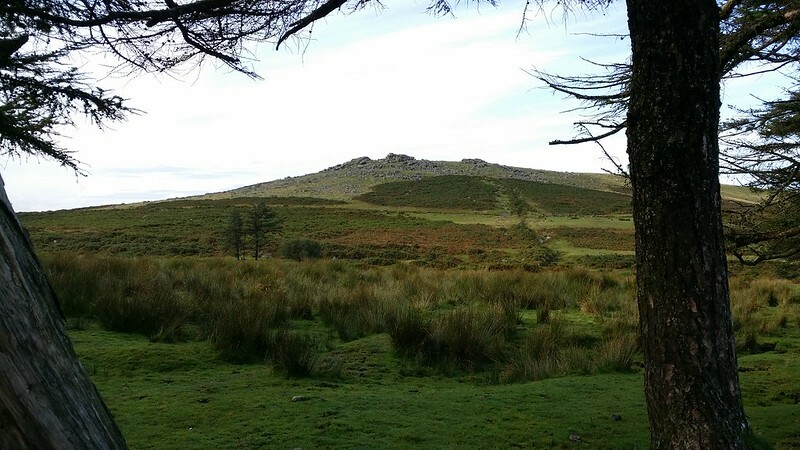 Our final target is Whitehill Tor, a roadside tor around the corner. Another ten minute bag and then we’re done. 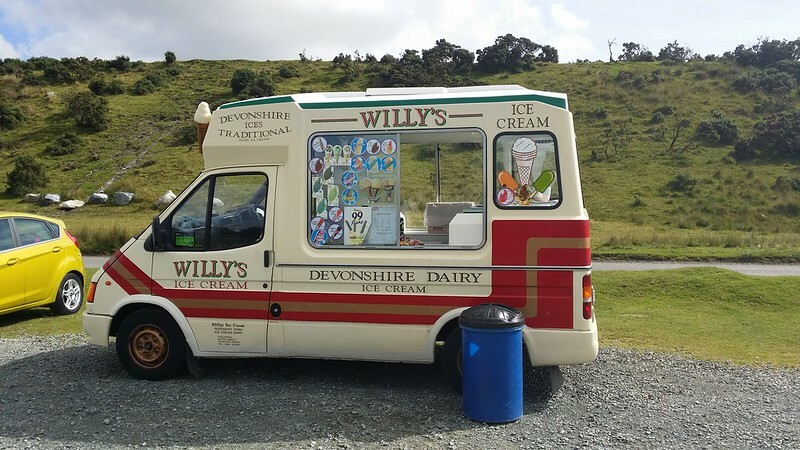 Paul drives us back to Yelverton, stopping for the mandatory ice cream when a van is spotted. It’s rude not to have clotted cream and a flake on it too. We say our goodbyes and Rich and I head off on the bus to Plymouth where we just have time to grab a chicken dinner and a pint before getting on the train home. As I’ve already said, this was the first time I’ve used the sleeper, and I’m really glad I did. It neatly solves the problem of getting to the hills after work at a weekend without losing too much of the weekend itself. 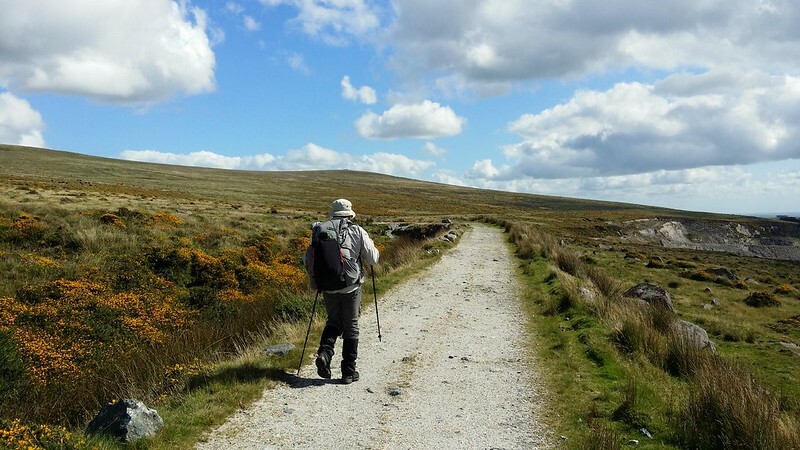 This allowed two decent days of walking – one long one and one moderate one, which is enough for a weekend. I’ll be doing this again. And moreover, the Scotland sleeper runs to very similar timings to the Lake District, so I’ll be trying that one too.